New Shirt! 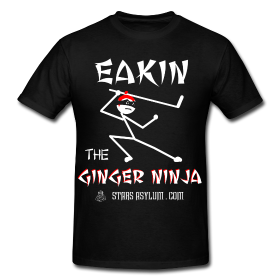 Cody Eakin, The Ginger Ninja! nowhere! EAKIN SCORES!!!! The Ginger Ninja has quickly become a fan favorite in his first year with our Stars. This 21 year old stands out on and off the ice not just for his bright red hair; his play speaks volumes for this young forward. When he was traded for Ribs many people were upset. That has changed after watching him swoop in and fill the hole of the ice left by Ribeiro. He strikes fast, hard, and quick! So watch your back! The Ginger Ninja is the silent assassin. He can kill your teams momentum and hopes with a single swipe from his stick. Forget Chuck Norris. This is the ninja you should watch out for! Plus he’s a GINGER!!! To get the shirt, visit our store! As with all of our shirts, these are available in many colors including black, white, green, brown, and orange (doesn’t that just seem gratuitous? ).